I got a new machine to replace two older Linux machines, including shell accounts, e-mail, cvs, web, and firewall. The old machines are traditional towers with 5 total hard disks and a half dozen or more noisy fans. The new machine is "small form-factor", will have one hard disk and low/adjustable-RPM fans. The higher-powered of the machines it is replacing is a 1GHz Duron with 512 megs of RAM. In most respects this is still a perfectly adequate machine, but its OS (FC1) is beginning to show its age, and the RAM is often inadequate, especially since Ingrid is running a full set of desktop apps on it, including Firefox and OpenOffice. The new hardware should be overkill in most respects: More MHz, more RAM, more disk. The lists below are mostly notes for myself about the services I'll be moving to the new machine, but may someday be useful for others searching for info on the Biostar iDEQ 220k, especially when it comes to running Linux, Unix, RedHat or Fedora Core on it. Virtually everthing worked out of the box. The only thing I didn't try to do was use the onboard Via UniChrome PRO video. I copped out and put in a spare G400 AGP card before I booted the Fedora installer. So far, I'm happy with this machine and would suggest it to someone wanting to build a powerful but small AMD64 system. Until a year or so has gone by, though, I won't know if bad reliability or increasing fan noise will turn me against the iDEQ. 2005-09-06: I had a few unexplained lockups, but after connecting the "ATX12V" power they seem to have stopped. After a year, I remain pleased overall with the purchase. The performance is entirely adequate, the reliability is good, and the fan noise is still not bad. 2006-09-06: I tried the onboard Via UniChrome PRO video. With the "vesa" driver, the console turned black and wasn't usable again without rebooting. Back to the G400 AGP card. 2006-09-21: I installed the BIOS update "Vbk1227bf" from a floppy disk. Now, powernow-k8 can successfully change the CPU speed but I have had several lockups in the 24 hours since enabling the cpuspeed daemon. 2007-01-09: In view of the decision of the Fedora Legacy project to shut down, I have decided to move my server to Ubuntu 6.06 LTS. Because it takes quite some time to set up the large number of services, I've used this to justify the purchase of a new system. The ideq is still a perfectly adequate machine, but I just couldn't handle the X2 envy an longer. 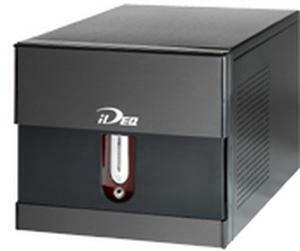 Later on, I plan to reinstall the ideq with Ubuntu LTS and work on an emc2 port to 64-bit machines. The total cost of the hardware I bought was $688 with second-day shipping from http://www.newegg.com, If I had to do it again, I'd skip buying the DVD drive and temporarily put in a drive from a different machine instead. If you're on more of a budget, get less RAM, a smaller disk, and a 32-bit AMD processor instead. You should be able to get down to around $500 this way. Yes, it's bigger than a Mac Mini, but it's also more powerful. Since Biostar hasn't bothered putting the manuals online yet, and newegg didn't say, I wondered what was included with the iDEQ, especially whether there were SATA power and data cables. Well, there are. The case has an external 5 1/4 and 3 1/2 inch bays plus two internal 3 1/2 bays. Each bay has the appropriate power cable and drive cable nearby, and the internal bays have both a traditional and SATA power connector. There's only one SATA data cable included, and it is packaged separately rather than preinstalled. The metal on one side of the internal drive cage is not rounded, though it wasn't sharp enough to cut me when I tried to push on it. In any case, forcing the drive cage out isn't the right approach. On the right side there is another piece which locks the cage in place. Pull this away and then slide the cage out by pulling on the front. The SATA power connectors appear to need an additional inch of slack to attach two SATA drives. When a floppy drive is installed flush with the front panel, and a floppy is inserted, the movable plate that hides the drive bays cannot be pushed "up". Either don't leave a floppy inserted, or install the floppy some distance back from the front panel. Near the front panel, there is a 26-pin connector marked JPRNT1. Using a spare cable from the office, I've routed this to the back where there's a punch-out hole for a DB25 connector. The cable was just long enough to reach from the connector to the back of the case. There does not appear to be a second serial port, however. The BIOS allows you to choose whether or not to pause the bootup process for certain errors (e.g., missing keyboard), and whether the power should be on, off, or the same as before a power loss. Another nice feature is a keystroke to change the boot device just once, so that you can leave the hard disk as the default device, but easily boot an installation CD once in a blue moon. These values are from the BIOS setup screens. Linux' lm_sensors installs but doesn't give plausible results. But now I have had several lockups in the 24 hours since enabling the cpuspeed daemon, and will be going back to a fixed-CPU-speed setup.. The blinding blue hard-drive activity LED is bad enough, but the "power on" LEDs change colors constantly in a predefined sequence of colors. I wish I could make it stop. For now, lowering the plastic piece that hides the drive bays mostly blocks the light and also prevents accidentally touching the power switch. 2006-09-06: Fixed! While the front panel items all go to a single connector at the motherboard, the power LED has a separate connector in the middle, which I've now disconnected. 2006-09-21: I replaced the internal PCI network card with a USB NIC (DUB-E100 rev-B which required kernel patching before use---beware this device) so that I could add a BusLogic SCSI controller, which runs an external HP SureStore DLT70 tape drive. This works nicely so fa but the fan in the tape drive's enclosure is unfortunately quite loud. I let memtest run for about 80% of a cycle. No errors were detected. The full cycle would have taken something over an hour. Installed great from Mini Install CD. Recognized drive as SATA. Kernel compiled in under 3 minutes wall time. Installed great from CD. Recognized drive as SATA. "dd" and "hdparm" both reported very nice numbers, over 60 MB/second, for disk transfer rates. Kernel only used 860MB(?) of RAM. I had already downloaded the 2.7GB of stentz-binary-x86_64, and burned the first CD. Using linux askmethod, I used the .iso images from the network. One install errored out, something to do with the Logical Volume Manager (LVM). When I installed again, I made traditional partitions, not LVM partitions, and everything worked. This is apparently a known bug. After the install, there were over 600 megabytes of updates, which "yum" took its sweet time downloading. I also installed a few more packages with "yum", and rebuilt icewm from a source RPM. There's been one really weird thing since installation: Some .pyc file became corrupted. I don't know if it was corrupt on disk, or in RAM. The symptom was that running 'yum' would exit with a traceback about site-packages/PIL/__init__.py. I fixed it by removing a bunch of .pyc files. I'm tempted to do a longer memtest run to see if it exposes a problem. Contrary to what I expected, rpmbuild --arch i386 ... is not enough to build a 32-bit RPM on an x86_64 machine. Instead, something called mock must be used. The full incantation ends up looking something like this: rpmbuild -bs foo.spec; setarch i386 mock --no-clean ../SRPMS/foo-1.0-0.src.rpm. Without the additional setarch, one build failed when it tried to run gccmakedep-x86_64, which wasn't installed in the mock environment. I was unable to get tightvnc to build, either as a 64-bit or 32-bit package. Instead, I installed a binary package for fc3/i386. It seems to work. Using mock I've now built a binary package for fc4/i386. I haven't tested it yet. The package "irssi-0.8.9-7.x86_64.rpm" doesn't work. When running irssi, a dynamic linker error libgc undefined symbol: pthread_mutex_trylock is printed. I installed an fc4/i386 package instead. Since that time, I upgraded to gc-6.6-4.fc4.x86_64 and irssi-0.8.10-1.x86_64 which work properly. Due to license issues, Fedora has dropped uw-imap. However, I have all my mail in their "mbx" format. So I've built a uw-imap RPM based on my own spec file. It's now lightly tested and seems to work just fine. At the moment I'm using dovecot, though. Swish-e isn't packaged in fedora or fedora-extras (what full-text indexer is?) and the included specfile doesn't work. So I had to built it myself. The good thing is that it seems to work properly on 64-bit systems. SATA, Audio, USB, and ethernet all work out of the box. FireWire appears to be detected, but I have no devices to test with. The onboard video does not work with Fedora Core 4's X server using the "vesa" driver. There's not much of an upgrade path for this machine. Nevertheless, there are a few things I might change before this system becomes obsolete. It should be possible to place a second hard drive in the case, or to add an external USB 2.0 or firewire drive. It would be possible to upgrade the CPU, but options are limited for "socket 754". Here are some of the pages I've found while searching for information about the hardware I bought. Notes about iDEQ 220k on OpenBSD Linux (Debian unstable), DragonFlyBSD and OpenBSD installed flawlessly. Disks were properly discovered, USB2 works, sound works, NIC works. Biostar's page on the IDEQ 220k The Biostar iDEQ is a versatile small form factor system designed to meet your computing and entertaining needs. AMD 64 > AMD Cool'n'Quiet (PowerNow) on FC3 x86_64 [The] cpu is changing frequencies. So my problem boils down to regulating the fan. Serial ATA (SATA) on Linux VIA VT8237 South Bridge chipset, using VT6420 Serial ATA chip. fakeraid. libata's "sata_via" driver set provides beta-level support a/o 2004-02-25 (included in kernel v. 2.6.3). Recent 2.4.x drivers/ide code should support it, too. Serial ATA (SATA) Linux status report Says of VT64xx: Summary: No TCQ/NCQ. Looks like a PATA controller, but with full SATA control including hotplug and PM. HARDWARE SATA - Gentoo Linux Wiki Below is a non-comprehensive list of which chipsets are supported by which module. Is there an amd64 driver for VIA UniChrome graphics controllers? Unofficially yes. If you have an AMD64 system with VIA UniChrome graphics (i.e. a VIA based K8 mainboard with on-board graphics) you'll most probably need the driver below. It is Xorg CVS (2005.06.21) snapshot of the driver compiled as part of xserver-xorg 6.8.2-10 (Hoary). So, it may or may not work if you use another xserver-xorg version. Unichrome support for X.org An X driver suitable for X.org and Xfree86. It provides support for VIA CLE266 and KM400/KN400. K8M800 and PM800/CN400 support is still limited. Biostar iDEQ 220V Cube A 2003 article about an earlier iDEQ, this one for Socket A Athlons. Devices of type >Printer< Linux USB support for parallel-type devices. Details for printer driver These pages, as well as a look at the kernel source, make it sound like a lot of USB-Parallel converters will work with Linux. There's nothing scientific here, but how is that different from many of those hardware review sites? (1)I can't get the ideq 220k to power down using the 64 or 32 bit version of fedora 4? I tried using acpi=off/acpi=ht during bootup, and turning acpi off in the bios, and still it doesn't shutdown properly. How did you get your system to turn off properly? (2)I can't get my pci modem(3com/usr) to work with fedora 4 64 bit version. It does however work with the 32 bit version. Do you have any pci problems such as this? I don't have a modem on this machine, and since it's on 24/7 I don't depend on APM or ACPI for shutdown. I think reboot must work right, I don't remember being surprised that it didn't. I'm thinking about putting together a SFF PC. Before I found this page I spec'd one out and came up with a very similar list of parts. I saw the ideq200k on Newegg, but was leaning towards the Shuttle XPC SN85G4V3, which looks to have very similar features and costs about $20 less. Any thoughts? Did you consider any other barbone systems? I'm also planning on running some flavor of Linux, probably FC4 like you.